The tech community is abuzz because of a change in Google Search this week. Google started rolling out personalized results into its search results this week, calling it “Search Plus Your Web.” Now, when users are signed into Google, Google+ Profiles, Pages and other content will show up in their searches. The move is not a complete delve into social search, as there are still “global search results,” which will toggle on when clicking the button on the upper right hand corner of results or by signing off. The idea behind Google’s new social search is not new; content shared by friends is more relevant than that shared by strangers. People have been conducting their own social searches using social networks like Facebook and Twitter for years by asking for recommendations directly. “Search Plus Your Web” automates this process and allows for instant results rather than waiting for someone to actively respond. Many social networks and travel sites not associated with Google such as Twitter, Facebook, Yelp and TripAdvisor are displeased with the changes because they “favor” Google+ Pages, Profiles and pictures over their own by placing them on top of search results. 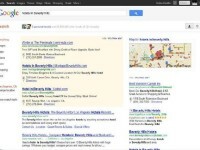 Google also displays Google Maps , Google+ Profiles, and Places pages on the right-hand side of searches for places. What does all of this change mean for hotels? They can no longer afford to ignore Google+ and Google Places as a growing social network. Google is the largest search engine, and it is commonly known that many people do not look past the first page of their search results. A Google search for “hotels in Beverly Hills” will bring up the page below, with personalized results at the very top of the page. When a traveler sees that someone in his or her network has posted about a hotel in the area they are researching, as long as it is a positive review/post, it is likely that they will consider that hotel over random results further down on the page. Further, a search for information on a specific hotel (such as Four Seasons, pictured below) will bring up not only personalized results at the top, but also its Google Places on the right-hand side with maps, pictures and information such as prices, bus lines and ratings. Having all this displayed is valuable because customers instantly have potentially enough information to decide whether or not to stay at this hotel right without even leaving the search results. Does your hotel’s Google Places page contain pictures? If not, it certainly should. If so, do they highlight the positive aspects of your hotel? It may be time to update those older pictures, especially if the hotel has recently gone through renovations. Where do you stand in terms of reviews on Google Places? If many of your reviews are negative, perhaps you need to work harder to encourage happy guests to review on Google Places.